You are not likely to have a more “New York experience” than you will attending this summer’s second free Shakespeare in the Park offering—a Public Theater “Public Works” musical adaption of “Twelfth Night” with songs by rising star Shaina Taub and an enormous cast of 75 professional and amateur actors of all ages, races, sizes, and abilities, hailing from each of the City of New York’s five boroughs. Now marking its fifth anniversary, the Public Works initiative engages people and organizations across New York to participate in creating theatre “not only for the people, but by and of the people as well”. 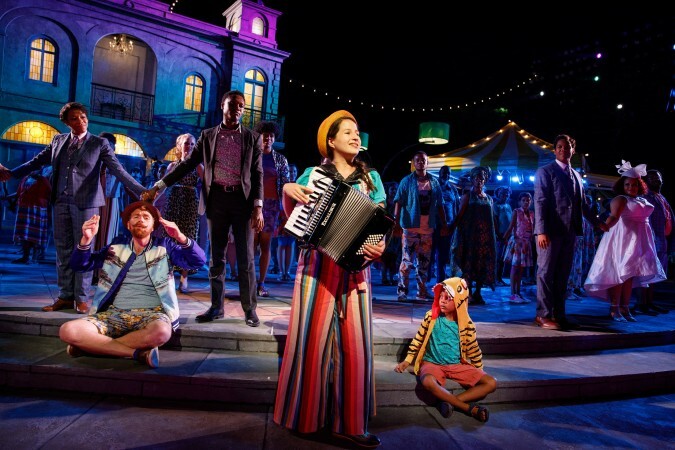 Sitting in the outdoor amphitheater of the Delacorte Theatre in Central Park, faint stars above and occasional sirens in the background, the audience around you looks like New York, and the cast onstage does, too. And boy, is that refreshing. The founding impulse of the Public Theater was to make theatre accessible to all people, regardless of background or income. The cornerstone of that effort is the annual summer season of free Shakespeare in the Park, but it expands to other initiatives as well, including Mobile Unit productions that bring Shakespeare to those who can’t make it to Central Park, and Public Works, which directly involve members of the community as performers. 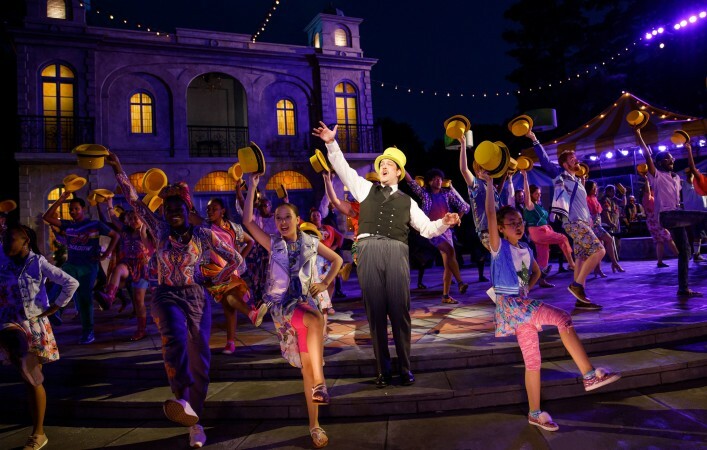 This new musical adaptation of “Twelfth Night” played a five performances in 2016 as part of Public Works, and has now joyfully been given a full, five week, mainstage run in Central Park, ending on August 19th. My advice? Get thee to the Delacorte before it is too late (find out how to get free tickets here). Ms. Taub, alongside co-conceiver/director Kwame Kwei-Armah and director Oskar Eustis have created a magical, festive, and highly accessible evening of Shakespeare that lifted my spirits, kept me grinning from ear-to-ear, and sent me out of the park and back into the concrete jungle of Manhattan with a pep in my step and a flutter in my heart. “Twelfth Night, or What You Will” (circa 1602) is one of Shakespeare’s most beloved, and frequently performed, comedies, with its paradigmatic cross-dressing leading to mistaken identities, faultily-constructed love triangles, and a happy ending. Twins Viola (Nikki M. James, “The Book of Mormon”) and Sebastian (Troy Anthony) are separated in a shipwreck on the shores of ancient Ilyria (the present-day Balkans); Viola disguises herself as a man named Cesario and is hired by Duke Orsino (Ato Blankson-Wood, “Transfers”), with whom she falls in love. The Duke is in love with Countess Olivia (Nanya-Akuki Goodrich), who mourns the loss of her brother—trailed by a wailing New Orleans brass trio—and ends up falling for Cesario (aka Viola). Meanwhile, Olivia’s inebriated uncle Sir Toby Belch (Shuler Hensley), her maid, Maria (Lori Brown-Niang), Sir Andrew Aguecheek (Daniel Hall), another frustrated suitor, and an accordion-clad fool named Feste (Shaina Taub, the composer/lyricist), conspire to trick Olivia’s steward Malvolio (Andrew Kober) into believing that she is in love with him. When they look, who do they see? Why has this power in me never been given a chance? Is it as simple as putting on a pair of pants? Far from being a jarring insertion of modern mores, Ms. Taub’s lyrics have the effect of embellishing a 400-year old character’s vantage point in a fresh and vibrant way. While purists (and scholars!) may roll their eyes, musicals have a paradoxical power to simultaneously simplify nuanced ideas and heighten emotional resonance. The sacrifice of the former, here, is equally made up for by the pleasure of the latter. To from crib Mr. Shakespeare, if empathy be the message of the song, play on! My abounding hope is that this jubilant production of “Twelfth Night” is licensed for communities around the country—and the world—to follow the Public Theater’s model. If nothing else, high schools across the nation should be chomping at the bit to produce this new musical adaptation of a classic play (instead of doing the same shows again, and again) that is purposefully designed to big, inclusive, fun, and simple and cheap to stage. In the meantime, catch this production while you can. Bottom Line: The Public Theater presents a free, Public Works musical adaptation of Shakespeare’s “Twelfth Night” in Central Park. Featuring songs by Shaina Taub and a cast in excess of 75 professional and amateur performers of all ages, races, sizes, and abilities, this “radically inclusive” production is magical, festive, and highly accessible. Infectiously energetic and buoyantly spirited, do not miss this jubilant new musical.